When I was seven years old, my family was dropping my grandparents off at Logan Airport and we had a true celebrity sighting. We saw Bob from Sesame Street. My mother, ever the Sherlock Hemlock, spotted him first and literally started jumping up and down with excitement. The rest of us soon followed suit. Bob smiled that genuine Bob smile and waved back, and although I’ve met a handful of celebrities since then, I don’t know if I’ll ever be as excited as I was the day we saw Bob. We felt like we knew him. He had been in our living room every day, twice a day, pretty much since my brother and I were born. Bob was a huge part of our lives, and this week, as PBS celebrates its 45th birthday, I realize what an impact public television has made on me—an impact for which I am eternally grateful. Most children probably got their introduction to PBS like I did, through Sesame Street. Some of my earliest and fondest memories involve Super Grover, Gordon and Susan, and Guy Smiley. My brother and I played educational Atari games featuring Cookie Monster and Big Bird. We read The Monster at the End of This Book until it fell apart. To this day, the only way I can count to ten in Spanish is by singing the song Maria taught me, and every six months when I go to the dentist, I wonder why I don’t have a llama to bring along with me. Sesame Street helped us with our letters, our numbers and our social skills, and even now, when I see the gang in the Macy’s Thanksgiving Day Parade, I get all warm and fuzzy inside—especially when I see my old friend Bob. But Sesame Street wasn’t the only PBS show that made childhood what it was. There was also Mr. Rogers’ Neighborhood. I don’t know anyone who didn’t want a neighbor like Mr. Rogers, with his cardigans and his comfortable shoes and his trolley. Mr. Rogers was a kind, genuine, trusted friend to us all. He took us on factory tours. He talked about his feelings, and our feelings, and never talked down to us because we were children. He taught us about imagination, with the Neighborhood of Make-Believe and Prince Tuesday. “It’s Such a Good Feeling” was so much more than just a song; it was what happened when watching the show. I know I’m not the only one who cried when Fred Rogers passed away in 2003. Even those of us who hadn’t watched his show in decades felt that we had lost a friend. 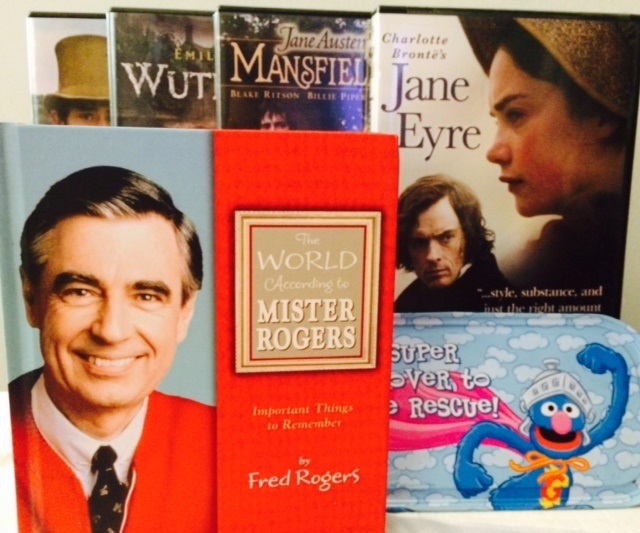 PBS has always been the perfect place for book lovers too. I think we can all agree that Reading Rainbow was the greatest show ever. Show me someone who doesn’t smile when they hear the words “butterfly in the sky,” and I will show you a robot. LeVar Burton understood how fantastic books were, whether he was discussing Miss Nelson is Back or Marc Brown’s Arthur series. But you don’t have to take my word for it—take a look (it’s in a book!) at the millions who donated to the Kickstarter campaign to bring Reading Rainbow back for today’s kids. In the late ’80s, PBS also gave us a series based on Beverly Cleary’s Ramona books. It was the thrill of a lifetime to see our favorite eight-year-old in action, watching all of the books’ quintessential moments—from wearing her pajamas under her school clothes to squeezing a tube of toothpaste in the sink—come to life on the screen. As adults, PBS continues to nurture our love of learning. Through American Masters, I have learned so much more about the lives of Mark Twain, Harper Lee, J.D. Salinger and Margaret Mitchell. In today’s world of cutthroat culinary competitions, I know that I can turn to PBS to give me the kind of traditional, instructional cooking shows I loved to watch with my grandmother as I was growing up, when she would ask me to fetch a pen and paper so we could write down the recipes together. And then there’s Masterpiece. I kind of like to think of Masterpiece as Reading Rainbow for grown-ups, with Laura Linney or Gillian Anderson filling in for LeVar Burton. Thanks to Masterpiece, we can enjoy brilliant adaptations of classics by Jane Austen, the Brontes and Charles Dickens from the comfort of our couches. We can obsess over addictive series like Downton Abbey, Call the Midwife, The Paradise and Sherlock. PBS continues to teach us just like it did when we were children, only then it was letters and numbers, and now it’s history and customs of the early 19th and 20th centuries. PBS has always reminded us that their programming is made possible by viewers like us. Well, as PBS turns 45, I’d like to thank them for everything they’ve made possible. I honestly can’t imagine my childhood without it. I can’t imagine my life today without it. PBS continues to foster a lifelong love of learning in all of us, and it always has been and always will be a place where we can go to exercise our minds and enjoy great TV without having to worry about obnoxious political ads, tabloid reality shows or vulgarity for the sake of vulgarity. The world is changing more rapidly than ever these days, but a good thing will never go out of style. It’s nice to know that PBS remains as relevant as ever, and that it’s still a place where our kids can learn with Big Bird, and where our grandmothers can jot down recipes. It’s obvious you have such a love of learning. That makes you truly special. I still don’t know how you remember such detailed information. It’s a true joy to see all the love you put into your words. Keep it up Stephanie!